Welcome to DiveBuzz! Stay up-to-date with DiveBuzz by following us on Facebook and Twitter, subscribing to our RSS feed and signing up to the DiveBuzz Newsletter on the right. Thanks for visiting! As divers, we all know the risks involved in diving. That said, with appropriate training and the application of safe diving practices, diving is a safe sport. Like any sport of course, accidents do happen. Sometimes fatalities occur. Whilst unfortunate, diving fatality data provides us with an opportunity to review and reassess our practices and helps us to make the sport even safer in the future. Divers Alert Network (“DAN”) produce a wealth of data regarding reported diver fatalities and it is true to say that I have an almost morbid fascination with this data! Scanning through the pages of the DAN statistics, it does not take long to spot some key trends. In many cases, adherence to standard dive practices such as appropriate pre-dive safety checks and proper weighting could have prevented the fatality. Standard diving practices aside, a dominant cause of diver fatality is drowning, in many cases brought on by heart attack. Growing obesity problems globally, associated heart issues and our increasingly sedentary lifestyles are becoming a real issue of the modern day. This is no different in the dive community. I see divers all the time that are unfit and overweight and, as a result, they are exposing themselves to higher levels of risk when they dive. Aside from the risk factor, nobody wants to see an out of shape, scantily clad body struggling to get into an ill-fitting wetsuit on the dive deck, it’s just not a pretty site! With this in mind, the importance of a healthy lifestyle and fitness is key in minimising your risks as a diver. Diving exposes the body to a quite unique set of physiological demands. 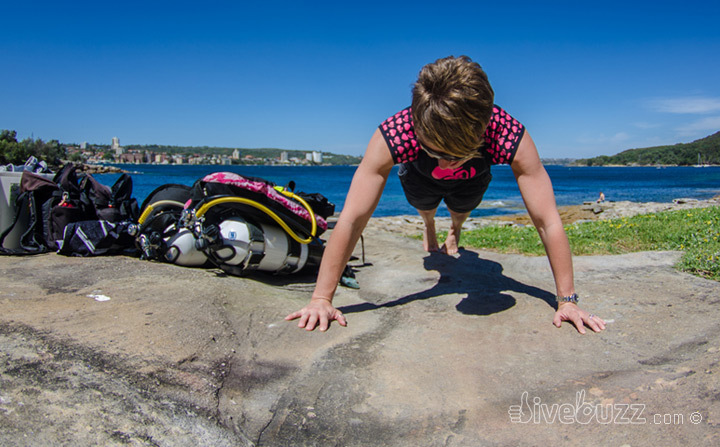 To ensure you get the most out of your diving and reduce the risks involved, it is important to have a suitable level of aerobic capability and strength. This will ensure that your body can meet the unique demands placed on it through diving. Of course, your level of fitness and preparedness will vary depending on the type of diving that you are participating in. Temperate water diving, technical diving or diving in sub-optimal environmental conditions will require a different level of preparedness to diving on warm tropical reefs with optimal conditions. Healthy heart guidelines recommend that individuals between the ages of 19-64 years old should participate in 150 minutes of “moderate” exercise a week. Ideally, this should be taken in blocks of 30 minutes a day, 5 days per week. Yes that’s right, 5 days per week. It is recommended that the 150 minutes of exercise includes a combination of moderate intensity aerobic activity such as cycling or even fast walking and includes muscle-strengthening activities on two or more days that work all major muscle groups. As an alternative to the 30 minutes of moderate exercise, 5 days per week you can try 75 minutes per week of vigorous-intensity aerobic activity such as running, squash, cycling or high intensity training (“HIT”). Plus muscle-strengthening activities on two or more days a week that again work all major muscle groups. A combination of moderate and high intensity activities and strength training would also work. The important thing to remember here is whatever you do, it is better than nothing so even if you only have a few minutes, there are an array of activities that will help keep you fit and healthy, not just to dive but in general life. So no excuses that you don’t have enough time! If you are new to exercise, it is recommended that you consult with your physician prior to commencing an exercise program. Will I get fit by SCUBA diving? Of course, diving itself, which is considered to be a moderate form of exercise, is a fun way of counting towards your weekly target. Be cautious here however, if you are a relaxed diver, diving from a boat in minimal current, the level of exercise that you are getting is obviously less than some alternative forms of exercise. Diving does however focus on specific muscle groups in the legs, glutes, back and core as we engage these muscles to glide through the water. It is also a low-impact form of exercise that is far more exhilarating than hammering your knees on the tarmac! Add to this carrying and lifting heavy tanks and weights and walking over sand in full dive gear when we shore dive and this has got count! Once a diver always a diver, as the saying goes! This means that diving careers can often be long. With this in mind, don’t lapse into neglect. As we age, it is often difficult to remain in peak physical wellbeing. But it is even more important for divers, above others, to try to maintain their wellbeing throughout their diving career to minimise their risk. So don’t take your physical fitness for granted. In summary, physical fitness – both strength and aerobic – is very important for divers. So after consulting with your physician, get out there and hit the gym, get a fitness “buddy” or a personal trainer, dust off that bike that is rusting in the back of your shed, fasten up your laces and get moving, whichever way you like. Happy training. Happy diving! Are you a fit diver? What exercise do you do to stay in shape? We’d love to hear your stories! If you enjoyed this article and think your friends would too, share it with them, they'll love you for it! You can also join the conversation on our Facebook page, or in the comments below. Share the buzz. Share the DiveBuzz! Me and my husband are licensed scuba divers and even with the experience and expertise that we have, we always make sure that we are fit before embarking on a dive. This keeps up in tip top shape, avoiding possible injuries that could happen. Follow us on FacebookAnd become a DiveBuzz fan!